CHICAGO--April 2 was an historic night in the history of Chicago mayoral politics. It was the first time two Black women were vying for the highest political office in the city, and the first time an openly gay candidate was on the ballot. It would be only the third time that a Black person held Chicago’s mayoral seat, as well as the second time that a woman would be the one sitting in power at city hall. The victory would also be one of the most lopsided ever as Lori Lightfoot, an attorney and former federal prosecutor billed as a political outsider, having never campaigned for elected office before, was the runaway winner. She garnered 74 percent of the vote and swept all 50 of Chicago’s wards, and 2,049 of the city’s 2,069 voting precincts. It was a watershed moment for a city facing major changes and challenges. Now that mayor-elect Lightfoot is poised to assume the reins from outgoing mayor Rahm Emanuel, she has work to do to restore faith in the mayor’s office, which has a history of controversy, and restore faith in Chicago communities that are underserved, overpoliced and seemingly forgotten. “This is a very dynamic moment in the history of Chicago. I believe a lot of children woke up this morning with hope, because that’s what it’s all about, giving our children hope. Hope for a better education, hope for being able to live in an area where they do not have to be fearful of crime and in an area where there is economic development,” said Dorothy Brown, Clerk of the Circuit Court of Cook County, during a joint April 3 press conference featuring mayor-elect Lightfoot and the woman she beat, Cook County Board President Toni Preckwinkle, hosted by Rev. Jesse Jackson at his Rainbow PUSH headquarters. “We have some real challenges ahead in our county and in our city and I look forward to working with Mayor-elect Lightfoot to address those challenges,” Ms. Preckwinkle said. The two women were the last candidates standing out of a larger field earlier this year. Neither won 50 percent of the vote plus one, leading to the April runoff election. “Today, you did more than make his- tory. You created a movement for change. You know, when we started this journey 11 months ago, nobody gave us much of a chance. We were up against powerful interests, a powerful machine and a powerful mayor,” observed Ms. Lightfoot in her election night acceptance speech. It is that final sentence that many who live in Chicago’s poor and impoverished neighborhoods hope aren’t empty words spoken by a politician. According to a study by the Social IMPACT Research Center, almost a half million Chicagoans live in what is considered to be extreme poverty, another half million are at or below the poverty line, and 538,384 people would be considered low income, meaning they live just above the poverty line. In a city of approximately 2.7 million people, roughly 1.5 million of them are experiencing some form of poverty or financial hardship in America’s third-largest city. In many of Chicago’s poorest areas, residents have seen school closures, business closures, communities that are food deserts with no grocery stores nearby, and other forms of decline and decay. The only thing that seems to be constant in Black and Brown, low income and poor communities, is heavyhanded policing. Restoring faith in the people who experience these day-to-day realities will be one of Lori Lightfoot’s toughest tasks. In 2018, Mayor Rahm Emanuel called for an independent review of all the cases Ms. Lightfoot decided the outcomes of as Police Board president. He accused her of using her position as a springboard to running for mayor. The irony in the accusation is Mr. Emanuel appointed her twice to be president of the Police Board as well as co-chair of the Chicago Police Taskforce on Accountability, the same group that lambasted the Chicago Police Department for its handling of the Laquan McDonald shooting. That tragedy, the murder of a teenager at the hands of a Chicago cop and a subsequent cover-up, started political dominos falling that led to Mr. Emanuel’s decision not to seek reeelction given fallout and protests about his role in covering up what happened. His decision opened the door for the Lightfoot win. Ms. Lightfoot, in her victory speech, pledged to tackle crime in Chicago, but said nothing about holding police accountable when they abuse the power of their positions. This is part of the reason Mr. Russell says he is somewhat skeptical about what the Lightfoot victory will mean for Chicago’s Black and Brown people. Others are reserving judgment, choosing to see an opportunity to enact real change in the city. “The election of Lori Lightfoot as mayor could possibly represent a new beginning here in Chicago,” activist Tio Hardiman, a violence interrupter and former Illinois gubernatorial candidate, told The Final Call. “Over the last 20 or 30 years in this city, the same types of political candidates have always had some kind of tie to Chicago’s political machine, and they’ve run this city for a long time. While Ms. Lightfoot’s landslide win can be seen as a victory for Blacks, women, and the LGBTQ community, it came in the face of on increasingly dissatisfied Chicago electorate. When the original election was held on Feb. 26, the field included 14 candidates with Ms. Lightfoot and the Cook County Board president, receiving 17.5 percent and 16.04 percent of the vote, respectively, forcing a runoff. Voter turnout for the runoff was exceptionally low, with only 33 percent of Chicago’s 1.5 million registered voters casting ballots. During the April 2 election, only 504,123 people participated, more than 50,000 fewer than those who showed up just six weeks prior. Chicago is a city that has become increasingly gentrified, seeing its Black population steadily decrease. According to the Census Bureau, in 2016 and 2017, more Black people (14,000) left Cook County, Ill., than in any previously recorded years. Since 2010, Chicago’s Black population has decreased by more than 61,000. Black unemployment in the state of Illinois for 2016, according to the Illinois Policy Institute, was 12.7 percent, the highest in the country, with the bulk of that number being tied to manufacturing job losses in Chicago. Mr. Washington was Chicago’s first Black mayor and died while in office in November 1987. During the 1983 election, nearly 1.2 million Chicagoans cast mayoral votes (82 percent) representing, at the time, the largest turnout in the city in 25 years. Sixty-nine percent of Chicago’s registered Black voters participated in that election. To date, the 1983 Chicago mayoral election still has the largest turnout in the last 36 years. “So many politicians care about keeping their office and their pensions, more than about the needs of the people, and folks are tired of the same old status quo,” Mr. Russell said. Noted writer, author and activist Conrad Worrill shared sentiments similar to both Mr. Hardiman and Mr. Russell regarding low turnout. Father Michael Pfleger of St. Sabina Church on Chicago’s South side, is an ardent supporter of Lori Lightfoot. As incoming mayor of Chicago, she is going to have a lot to deal with starting the first day she officially takes office, he said. 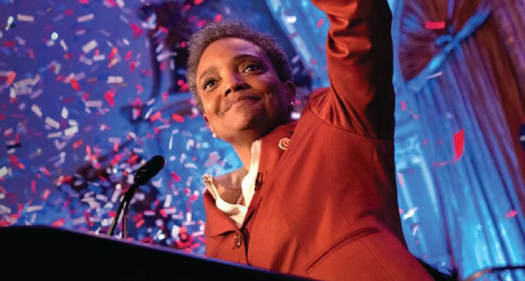 With Lori Lightfoot being the first Black woman, and only third Black person to be mayor of Chicago, the city, and by extension the state of Illinois, continues its history of placing Black people in prominent political positions. However, some are fearful Blacks who live in the city, the surrounding suburbs, and throughout the state, are being lulled asleep by symbolic representation—the idea that having Black people in high profile spots alone represents progress. Mr. Worrill warns against having that mindset and, instead, says Blacks need to shift to demand substantive results from elected officials—in particular the Black ones.